​The 2015 Indonesian smoke haze crisis from the burning of peat land in Kalimantan is caused both by large-scale clearance of land for industrial palm oil production and by local communities who are forced to open peat land for farming due to increasing population and poor productivity. Slash and burn forest clearing and draining of peat land can be reduced by sustainable land management and conservation education. Permaculture is an approach to organic farming that utilizes practical and low-cost strategies to promote biodiversity, soil health and sustainability. This can help communities better understand and appreciate ecosystem biodiversity in order to conserve natural environments and rehabilitate damaged ecosystems, as well as practice small-scale regenerative organic farming. 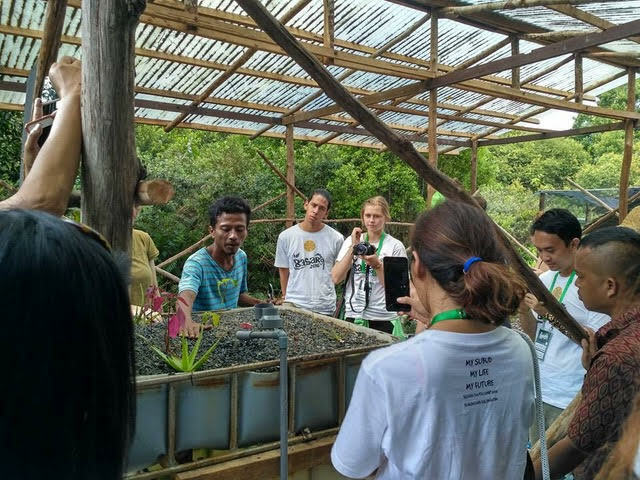 Frederika and Jayadi Paembonan are a young Subud couple from Australia and Indonesia who are trained in permaculture and are setting up a permaculture demonstration site in Sukamulya, Central Kalimantan near the Subud centre of Rungan Sari. For the past year, their non-profit community project, Yayasan Permakultur Kalimantan (YPK) has been working on a 150 x 150 foot lot to show how a local village dwelling and surrounding land can be converted into a sustainable productive system, and thus provide a model for local people to replicate in their own residences, land and farms. Susila Dharma Canada’s CAN$4000 contribution towards YPK’s 2019 budget will assist in covering operational costs as they continue to develop the permaculture demonstration site, adding bees and integrating animal husbandry (goats, ducks and rabbits) with small-scale aquaculture. The dwelling on the YPK demonstration site plan is also being expanded to incorporate a training space and community centre/performance space for the Penjelajahan Orangutan theatre project.